It’s been a busy week with the UK launch of Azure. We’ve been busy working with Microsoft on briefing the technical press, attending the launch of the Cloud Circle and writing articles for magazines. The momentum is really starting to pick up as awareness of Azure spreads. A number of potential customers are getting interested in the free Azure Assessments that we are offering in conjunction with Microsoft. For more info, download the flyer(162.74 kb). The following pictures were taken at the Cloud Circle launch event last night at the Kensington Roof Gardens. 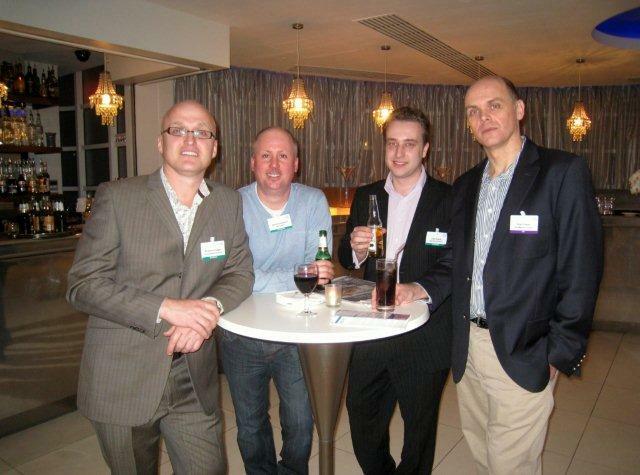 From left to right, me, David Gristwood (Microsoft), Dan Scarfe (DotNet Solutions) & Rob Fraser (RiskMetrics). We have asked Dan to shave his head so that he doesn’t look out of place in the future.